Full twelve months since the Co-op/CL joint venture that is the Darsham Hamper and already a quarter of the way through 2016. 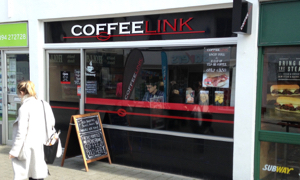 About time we visited a new branch of local indie Coffeelink. Seaside, driver! That Azzouz has finally found and fitted out a Felixstowe frontage, moving into the venerable Garrucci deli. Next to Subway and within spitting distance of the recently refurbished Costa, he means business. There are high seats at the window, throwing me briefly back to the sadly departed Enjoy!, and the comfort level rises the further you go in. Chiller is loaded with fresh baguettes and paninis, supplied I think from Delice, but me and Andy know what we want. Fresh bacon roll and a hot drink for a bargain £3.50, if you'd be so kind. That's a very good Americano, incidentally. We're tucking into our salty baps when who should turn up but Kev and the kids, still enjoying their Easter hols. Ain't this nice! Got papers, got WiFi, and weirdly got some b&w photos of some random Ipswich buildings. My idea would be to hold a local photographic competition. Winner gets their large canvas print on the wall and a year's supply of freshly roasted coffee. That aside, we can just about fit in sweet slices of bakewell and caramel tart before we waddle out. Support your local independent! If it was a car -- Opel Combo. If they were passing by -- Kev & Ruby & Tony.